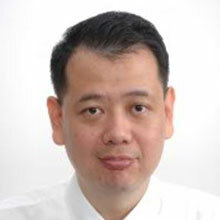 Chun-Huat Heng has been with the National University of Singapore since 2004 where he is currently an Associate Professor. From 2001 to 2004, he was with Wireless Interface Technologies, which was later acquired by Chrontel. A/Prof Heng received the B. Eng. and M. Eng. degrees from the National University of Singapore in 1996 and 1999, respectively, and the Ph. D. degree from the University of Illinois at Urbana-Champaign, in 2003. He has been working on CMOS integrated circuits involving synthesizer, delay-locked loop, and transceiver circuits. Provide synchronized clock down to 15ps resolution with proposed ΔΣ DLLUWB beamforming array that can provide 1o scanning resolution with 10× smaller area and power. Achieved 26pJ/bit energy efficiency employing band-shaping 16-QAM supporting 100Mbps with proposed injection locked transmitter. Combined low power sensor front-end and transmitter to implement a wireless health monitoring sensor for monitoring ECG, respiration and body temperature, which consumes less than 1 mW. A/Prof Heng has received NUS Annual Teaching Excellence Award in 2008, 2011 and 2013, and was in ATEA Honor Roll in 2014. He has also won Faculty Innovative Teaching Award in 2009. He was an Associate Editor for IEEE Transaction on Circuits and Systems II, and is currently a Technical Program Committee member for International Solid-State Circuits Conference and Asian Solid-State Circuits Conference. A/Prof Heng was an Associate Editor for IEEE Transaction on Circuits and Systems II, and is currently a Technical Program Committee member for International Solid-State Circuits Conference and Asian Solid-State Circuits Conference.